Set by a pond in the village of Bonnétage, this hotel offers an on-site gourmet restaurant and free Wi-Fi. Guests are invited to use the sauna, hot tub and fitness room in the wellness centre. The spacious guest rooms include flat-screen TVs and telephones. All rooms at Hôtel-Restaurant L'Etang du Moulin are soundproofed and, some have private balconies with views of the countryside. French cuisine prepared with seasonal products from the region is proposed in the restaurant, accompanied by specially selected wines. Breakfast can be enjoyed every morning. Free parking is available and fishing is possible in the on-site pond. 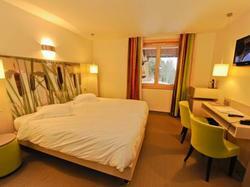 The hotel is 16 km from the Suisse border and 32 km from La Chaux-de-Fonds Train Station. Please note that the restaurant is closed for lunch from Monday to Wednesday. Spacious suite with a private balcony and views of the pond. Spacious suite with a minibar and a flat-screen TV, offering views of the pond or the countryside. Spacious room with views of the pond or the countryside. Some of these rooms have a balcony.